Emory’s Children’s Health Exposure Analysis Resource (CHEAR) Laboratory Hub team is composed of a subset of the HERCULES team. Their involvement with HERCULES and passion for pursuing the exposome allows the laboratory hub to capitalize on prior experience and greatly expand this type of research by providing comprehensive, exposome-level data for large numbers of children’s studies. The exposome is an acknowledgement that environmental exposures have cumulative effects throughout the lifespan, which is especially important within the context of children’s health. The exposome encourages and demands cutting-edge approaches, techniques, and thinking across environmental health sciences. Emory has developed and utilized the targeted and untargeted platforms in a core laboratory format and has created an intellectual environment that embraces advanced technology, cross-platform data collection, and complex data analysis and models. Emory’s CHEAR Laboratory Hub is composed of a Targeted Research Resource, Untargeted Research Resource, Biological Response Resource and Developmental Research Resource which provides services to the broader research community through the CHEAR network. The capabilities of the Untargeted and Targeted Research Resources are highlighted below. All requests for services must be submitted through the CHEAR Coordinating Center. The timeline for proposal submission is still being determined but will likely open in the fall of 2016. 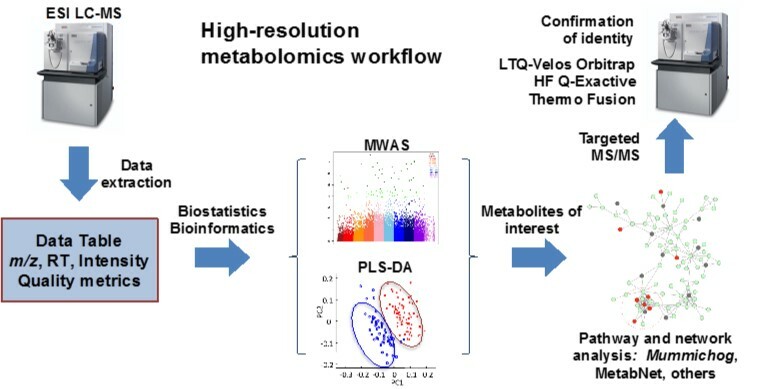 Untargeted metabolic profiling is available through the Clinical Biomarkers Laboratory, a state-of-the-art high-resolution metabolomics laboratory with three types of mass spectrometers (Thermo Fusion, Thermo Q-Exactive HF, Thermo LTQ-Velos Orbitrap) dedicated to clinical and translational metabolomics. The standard HRM analysis developed by the core uses ultra-high resolution Fourier-transform mass spectrometry and advanced data extraction algorithms to support broad coverage of endogenous metabolism, lipids, dietary chemicals, microbiome metabolites, drugs, and commercial and environmental chemical exposures. The methods allow untargeted measurement of environmental chemicals and associated effects of exposures on most human metabolic pathways. In analysis of human samples, multiple parameters have been optimized such as run time, mass accuracy and ion detection to routinely measure >20,000 ions with 5 ppm mass accuracy. Even for very low abundance peaks, MS/MS spectra can be reconstructed using deconvolution techniques. Analysis of samples will use five technical replicates because of the specific interest in detecting low abundance metabolites of environmental, microbiome or other exogenous source. Sample volume requested is 200 ul but smaller volumes can be accommodated. Results will be provided to investigators through the CHEAR data center. The Targeted Research Resource (TRR) at Emory will provide laboratory support to evaluate exposure by measuring chemicals in environmental and biological matrices in children’s environmental health studies. This support includes pre-analytic process consultation (e.g., sample collection, matrix selection, biomarker selection, fit-for-purpose analytical decisions) and analytical measurements of targeted chemicals of importance to the study. Although the emphasis will be placed on providing validated, quality analytical data, the core will rely upon nearly 30 years of experience in this area to assist the study primary investigators in maximizing use of the analytical data and producing valid interpretations of the data. Capability of measuring environmentally- and biologically- relevant chemicals in multiple matrices. Capability of measuring a broad array of chemicals using multiple fully validated methods developed by our research team. Use of multiple platforms of analytical methodology including HPLC-MS/MS, GC-MS/MS, ICP-MS, FT-MS, spectrophotometric and fluorescence immunoassays and absorbance autoanalyzers. Application of fit-for-purpose analytical measurements, that is, using the methods that is most suitable to provide the data needed. Harmonization of analytical methods among children’s studies and CDC analytical measurements. Highlighted in the tables below are analytical suites provided by the TRR, specific chemicals measured in the analytical suite and matrices from which measurements can be made.